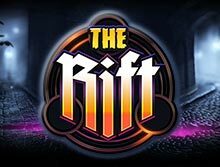 Release your wizardry demons, dust off your magic spell book and prepare for an adventurous journey in The Rift. If you are a science and fiction lover, you will definitely fall for this exciting video slot by Thunderkick software developers. All the action in The Rift slot game happens on a rusty street in an unknown town where strange things are happening. The game displays a certain quality of sinister that makes fun and immersive. The Rift video slot features five reels with three rows and the standard 17 possible ways to win. Also, there is a base game jackpot of up to 30 times, and you can choose to play in trial mode or real money. This function is helpful as it lets you test the game before you decide whether or not to advance to the real money version. Players will enjoy a relatively high theoretical return to player of 96.3% and a maximum payout of up to $81500. As it is with other slots from Thunderkick, you will enjoy stunning graphics and visual animations, seamless gameplay and multiple unique features and symbols. In addition, the win frequency is 26.9%, meaning your chances of winning are quite high. Enjoy The Rift video slot game from your smartphones, tablets and desktop computers from anywhere in the world. This video slot is set in a dark alley in a town with a rift splitting the street into two. You will see an eerie purple light escaping from the rift. There is also a wall in the background bearing some magical symbols, and it will be active throughout the gameplay. The symbols in The Rift match with the dark magic theme and they are arranged on a format of 3 rows, five reels, and 17 pay lines. The graphical representation in the game is superb as you can play it on a widescreen HD monitor without losing its original quality. Also, the sound effect used in The Rift slot is excellent but creepy to keep you immersed as you enjoy landing huge wins. The Rift video slot is played on a standard layout of five reels and three rows. The developer has also included 17 fixed pay lines which reward from left to right. It is on this layout that you will find the different symbols of the game. These include four coins made from different materials such as Copper, Bronze, Silver, and Gold. There are also four other symbols in the game including green perfume bottle, purple octopus relic, a classic pocket watch, and a magic spells book. The widening rift will swallow all these artifacts if you don't collect them. Will you manage to obtain all of them in time? As you may be aware, the betting line in The Rift slot is not adjustable but playing it will enable you to set the bet you place per spin. Click on the button that resembles a casino chip to adjust the amount you stake per spin. You can stake from as low as $0.10 up to a maximum of $100. The Autoplay button lets you set up to 5000 consecutive spins with the same bet amount. As you have read, the slots design is straightforward making it easy both for beginners and regular slots players to monitor the Total Cash Balance, Total Win, and Cash Bet values. Every battle against black magic powers requires excellent protection and support, and that is why Thunderkick provides you with several symbols and features. There are ten different sorcerous symbols; three of them (Wild, Rift Bonus Scatter and Sticky Wild) represent the special symbols. The symbol with the highest value is the Spell Book and landing five of a kind pays 30x, four pays 9x and three pays 3x. The purple pentagram with the word 'Wild' is the wild symbol and can any symbol except the bonus symbol. When a Rift spin is activated, any wild symbol not appearing on a winning pay line will become a sticky wild. In addition, 1-3 more sticky wilds will be placed randomly on the reels. Sticky wild symbols occur in the Rift spin feature and the bonus game. They will lock onto their positions and stay sticky for the rest of the game round or until they become part of a winning play line. Each bonus symbol that appears on the reels activates one step on the Rift seal until the seal is filled. Every third step will grant two additional Free Spins and add one more sticky wild to every remaining spin of the bonus game. 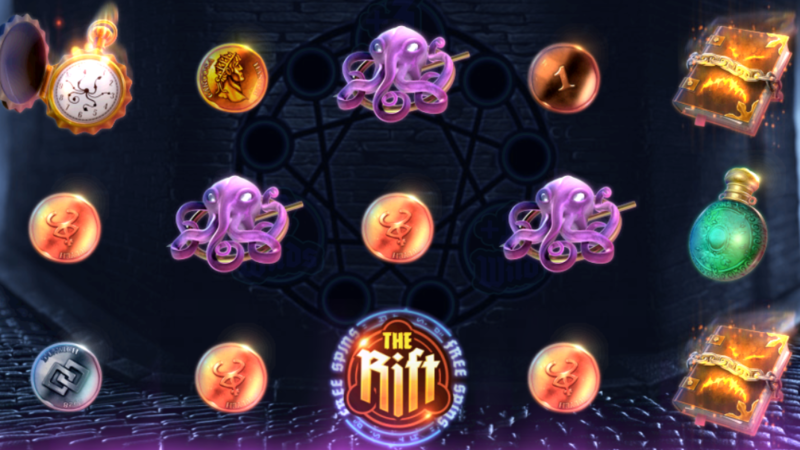 Play The Rift Slot on the Go! It is clear that advancement in technology unusual in the mobile sector has had a significant impact on the gambling industry. Mobile phones are convenient and affordable, making gambling on the go available at all times. Also, they have played an essential role in pushing online gaming into the mainstream. Thunderkick developers have adopted modern technology like HTML5 which makes possible for The Rift slot to be playable on smartphones and tablets. Enjoy this game instantly without the need for downloading an app at bCasino and stand a chance to win great rewards. Thunderkick is a Stockholm based software developing company dedicated to creating unique and engaging online video slots. Their games are known to feature stunning 3D graphics great visual animations. Although they have a small game lobby compared to giant developers like NetEnt, you will notice that they come with unique themes and features. The pride in being responsible for popular titles in the market such as Barber Shop, Magicious, 1429 Uncharted Seas, Birds on A Wire and Esqueleto Explosivo. You will their games listed on reputable online casino sites including our site. Are you looking for the best casino where you can play The Rift video slot and win some real money? Well, bCasino is one of the newly launched UK based online site offering players with different types of casino games like table and card as well as a live dealer. We have partnered with recognizable software developing companies like NetEnt, Thuderkick, Fugaso, Ainsworth, BetDigital, NextGen and many others. We also have additional promotional offers to enable you to win huge rewards throughout the week. Besides the vast game portfolio, you will be able to deposit and withdraw your winnings via safe and secure payment options like Mastercard, Visa card, Neteller, Pay by Mobile and Skrill. Reach out to our friendly and skilled customer support agents via email, live chat or telephone any time.